The Philadelphia 76ers have selected 19-year-old Washington guard Markelle Fultx No. 1 overall in tonight's NBA Draft. He averaged 23.2 points, 5.7 rebounds, 5.9 assists, 1.6 steals, and 1.2 blocks per game as a freshman. In a blockbuster trade earlier this week the Sixers sent their No. 3 overall pick plus a future first round selection to Boston in exchange for this year's top spot. The future first round pick in this trade has conditions. The Celtics will receive a 2018 pick from the Sixers via the Lakers if it falls between No. 2-5. Otherwise, they will receive the better of the Sixers' 2019 natural pick or their pick via Sacramento unless it is No. 1 at which point the Celtics would get the other one. 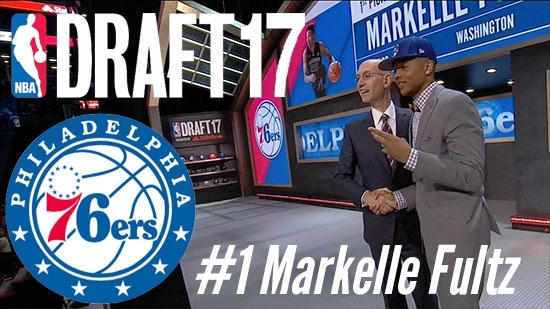 The 76ers also own 4 second round picks in this year's draft. Last year, the Sixers also selected 1st overall and chose Ben Simmons who was sidelined all season with a foot injury. The body of the second missing teenage swimmer was found this morning on the beach in Atlantic City. 15-year-old Ramon Quinn was discovered around 9:15 a.m. on the beach at Morris Avenue. 16-year-old Kaliyah Hand was found on Monday at Jefferson Avenue in Margate. Last Thursday afternoon, the two teens along with a group of their friends were swimming at MLK Beach in Atlantic City. Hand was in the water when she began to struggle against a rip current. Quinn jumped in the water to assist her, but both of them got pulled out and went under. The City of Philadelphia will honor R&B group Boyz II Men by renaming a stretch of Broad Street in South Philadelphia "Boyz II Men Boulevard." City Council approved the resolution proposed by Councilman Kenyatta Johnson on May 18th. The ceremony will be held this Saturday, June 24th at 11 p.m. on the block of Broad between Christian and Carpenter Street. The top selling R&B group consists of Philly natives Nathan Morris, Shawn Stockman, and Wanya Morris. They all attended Philadelphia High School for the Creative and Performing Arts together, which is located on that block of Broad Street. The group is known for their hits such as "MotownPhilly," "It’s So Hard to Say Goodbye to Yesterday," "I’ll Make Love to You," and "End of the Road."